"The Avengers battle The Terminator"
Earth's mightiest heroes are back, The Avengers return for a second team up in one of 2015s most anticipated movies and sees even more characters joining the ever growing franchise of the action spectacular. Avengers: Age of Ultron kicks off with a bang with our heroes attacking HYDRA's final stronghold in the war torn Eastern European nation of Sokovia, retrieving Loki's scepter from Thor and The Avengers. With the scepter Tony Stark (Robert Downey Jr.) hopes to use it make another scientific breakthrough: Artificial Intelligence, with the aim of his Ultron programme to protect Earth from a potential alien invasion and replace the Avengers and S.H.I.E.L.D as the global peacekeeper. But when Ultron (James Spader) becomes self-aware he sees the Avengers as the biggest threat to Earth and they need to be made extinct and recruits two genetically enhanced twins, Pietro and Wanda Maximoff (Aaron Taylor-Johnson and Elizabeth Olsen), using Wanda's psychic powers to manipulate the Avengers from the inside. Like the previous Avengers movie, Avengers: Age of Ultron has massive action set-pieces, Joss Whedon's trademark witty dialogue and completely embraces all of its comic-book aspects, this time having robots, AI and genetic engineering. It is gleeful fun. The movie starts by having a massive action sequence, being ripped from a comic book version of a war movie and the first scene being a continuous shot showing all The Avengers in action. The opening action sequence being like a Bond pre-credits sequence and it continues from there, having Iron Man fight The Hulk in South Africa, a big chase in South Korea and the battle with the robots at the climax, replacing the role of the Chitauri aliens from the first movie. All The Avengers have a moment to shine having character and action moments. We already know the main players and we all get to see inside the minds of the characters, seeing their fears, wishes or dark past. Stark's fear is of another alien invasion and linked to his post-traumatic stress disorder in Iron Man 3 and makes Ultron because he has a misguided idea to protect the world and his friends. Bruce Banner (Mark Ruffalo) becomes worried about becoming The Hulk again, unable to control the beast and having a romantic subplot with Black Widow (Scarlett Johannson), hinted at in The Avengers, as well as a way to prevent the Hulk being used for any situation. Jeremy Renner's Hawkeye was given the short straw in the last Avengers movie and his role is greatly expanded for the betterment of the character and the actor, seeing Hawkeye's personal life and interacting with his Avenger comrades. The Marvel Cinematic Universe has expanded a lot and Avengers: Age of Ultron showcases this with its many storylines and large roster of characters. Avengers: Age of Ultron is set very deeply in the MCU's lore, referencing events in The Avengers and Captain America: The Winter Soldier and sowing the seeds for future Marvel movie plot lines, i.e. Thor: Ragnarok, Black Panther and Avengers: Infinity War. Supporting characters from previous Marvel films make an appearance in some form and the membership to the Avengers has expanded: this is not the movie for newcomers to the MCU. Elizabeth Olsen and Aaron Taylor-Johnson are the big new cast members as the twins Scarlet Witch and Quicksilver. Last time they were in a movie together they played husband and wife. In the comics the characters are Magneto's children, but due to rights issues with 20th Century Fox their origins and source of their powers have had to be altered. Olsen is the stronger of the pair, having more anger and resentment due to the character's tragic past. Taylor-Johnson already had a challenge following Evan Peters' praised version of the character in X-Men: Days of Future Past. Taylor-Johnson was fine in the role, his version being the rational one of the pair, though he has a moment to goad members of The Avengers. James Spader does a decent enough job as the villain but Tom Hiddleston's Loki still holds the title of the MCU's best villain. Ultron is essentially Skynet in a physical form and has three main character motivations; his twisted view on how to save the world and the resulting God complex, his desire for a true physical form and his hatred and betrayal of his creator. Spader has a deep, boarding voice, fitting for his character, showing his rage and his action highlight is fighting Captain America in a large chase. Other established actors join the MCU in this movie in small roles. Andy Serkis gets to speak in a South African accent and properly relieved that he does not have to wear a skin-tight motion capture suit and his character is being set up for future Marvel movies. But German actor Thomas Kretschmann of Downfall fame has a thankless role considering his talents. 2012's The Avengers was a jolly entertaining movie, but even its most devoted fans will admit its story was thin. Now that the team and characters are all established Whedon was able to go deeper into the Marvel Universe, having multiple subplots with the characters having a moment of some sort, managing to balance out the large cast of characters for the most part. The plot is still simple, The Avengers need to stop Ultron trying to destroy the world, but Whedon is able to explore his characters more with the visions inflicted on them, seeing into their psyche and their different world views being shown. When the run up to the final battle happens it does have a rinse and repeat feel to the battle with the Chitauri with Captain America saying that the battle needs to focus on them. 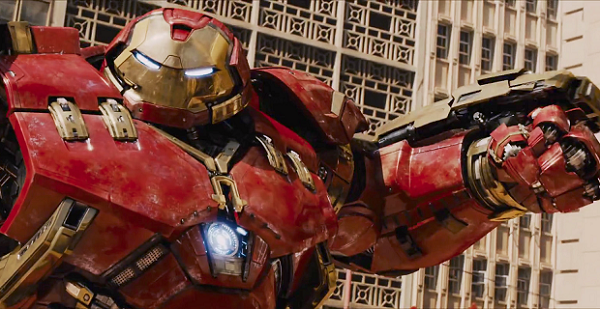 Avengers: Age of Ultron is a big, bloated superhero affair that has a belief that bigger is better. Fans of the MCU will enjoy the action and continuing expanding universe. But it does at times feel overstuffed and it is near impenetrable to the few people who are not sold on MCU.